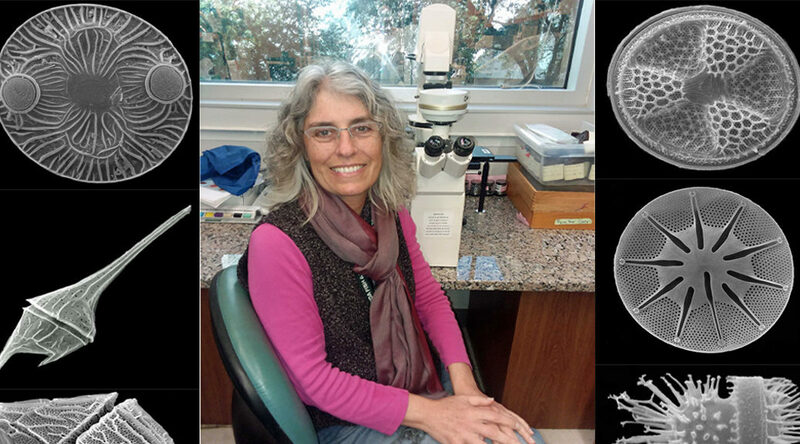 Célia Villac, Research Scientist with the Harmful Algal Bloom Group volunteered some of her time this month to explain her work at FWRI and beyond. What has your professional experience been like? Interesting, challenging, rewarding, fun…are words that come to mind. For the past 30+ years, since my undergraduate days, I have dedicated my time to studying marine phytoplankton diversity and ecology. Research opportunities have allowed me to investigate the phytoplankton of many different regions, from tropical seas to high latitude temperate waters. Phytoplankton from polar regions, however, I have seen only through samples taken by others and cultures. I have never been to the Artic/Antarctic Oceans, but I have “sailed” their waters through my microscope! I am interested in species-oriented processes, a fancy way to say I am a taxonomist interested in phytoplankton space-time distributions and their environmental controlling factors. Using light and electron microscopes are part of my daily routine due to my focus on identification based on morphology. The analysis of large data sets may also be part of my day (hours at the computer) since a single field sample may have dozens of species and we need dozens, hundreds of samples to understand phytoplankton patterns in an ever-dynamic ocean. I am part of the support team that issues daily and weekly Red Tide Status reports. I also invest time in meetings and conference calls because the results based on morphology and community structure is one piece of the puzzle that fits in a much broader scenario in which other researchers contribute with information that span from ocean circulation to the molecular makeup of the species of interest, as well as their physiology and life cycle strategies. What are you working on now or recently? We have had an intense Red Tide season (still ongoing) so I have been deeply involved with Karenia brevis monitoring and event-response for the past few months. Since the season started in November 2017, we from the microscopy lab have analyzed about 14,000 samples taken from all over the coast of Florida. In cooperation with colleagues in our HAB group, I am currently working on a book chapter about the biogeography of Karenia blooms and I am also involved in projects that aim to unravel the diversity of another HAB species very common in our waters, the diatoms in the genus Pseudo-nitzschia (https://myfwc.com/media/12495/pseudo-nitzschia.pdf). How is this information beneficial? Understanding the phytoplankton population dynamics of a given region may become a powerful predictive tool, a key component in HAB-event response. The correct identification of a species of interest is central to the problem. What is your greatest career accomplishment? This is a hard one to answer so maybe you should ask Mom and Dad – in their eyes, I have solved all the major problems of the world’s oceans! If I have instilled lasting interest for phytoplankton in a former (or current) student, I would consider that to be my greatest career accomplishment. On the daily activities front, time management to strike a balance between monitoring and research goals and demands. On the overarching science front, keeping up with the quick and ever evolving taxonomy of microalgae. I think there are two components. For one, I really enjoy phytoplankton taxonomy and ecology. Not only the organisms are beautiful and thus fun to look at but the dynamics of phytoplankton, either in the real world or in a laboratory flask, is fascinating. This world, invisible to the naked eye, has critters that can switch between being auto- to heterotrophs, that can perform long vertical migrations despite minute size, that can exude a chemical potent enough to kill a large mammal. Amazing! The second component is that research and teaching, at least in my book, mean relating to people, cooperating, exchanging ideas, constant learning – these experiences are what bring meaning to what I do from day to day. Was this your original career interest? Why or why not? A big YES here. I learned to love and respect the sea as a child. I decided I wanted to work with marine biology during my senior year as an exchange student at Bexley Highschool, Columbus, Ohio. My undergraduate final research project was on Marine Phytoplankton and I’ve stuck with it ever since. Moreover, I already knew I wanted to combine research and teaching/mentoring into my routine way back during my undergraduate years. No doubts; no regrets. What advice would you give to someone interested in pursuing a career in your field? My advice will have to be taken with a grain of salt because I am one of those few individuals who live in a special bubble: I have the privilege of making a living doing something I love. To a young scientist, I would say: Make sure to follow your passion and be aware that changing your mind and realigning expectations may be part of the process. The process is actually way more important than the product. Be open to work with others, to learn from others. And, of course, exercise and drink water. I enjoy going to the movies, cooking, reading, exercising (hiking, yoga, running, swimming, snowshoeing when in Michigan – all in moderation), and skyping with my family in Brazil. I like to strike a balance between staying quietly at home and socializing with friends and family. When a chunk of time is available, traveling is also on my list.